Richard Helzer was born on August 27, 1943. He received his BA from Univeristy of Nebraska at Kearney in 1965 and his MFA from the University of Kansas in 1969. After finishing graduate school, Helzer taught in Kansas for a year before moving to Bozeman, Montana where he currently works as director of the Montana State University School of Art. Helzer has been known in the art world as a metalsmith focused on jewelry making, but has recently turned to sculpture that combines images of the natural world with primitive tools. His works are wood constructions, trees, or branches that are covered with sheet lead and copper which are hammered and burnished into place. 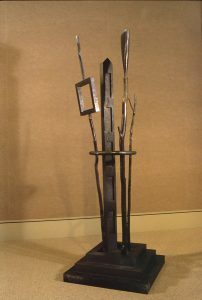 “My sculpture is about the confrontation between man and nature and time and nature; about a time when man was immediately a part of the earth and its natural occurences.” He has been a professor of Art at Montana State University since 1980, where he teaches beginning and advanced metalworking courses, basic design courses (summer), independent study (graduate students in all studio areas), independent study (upper level metalsmithing students), and serve on MFA thesis committees.